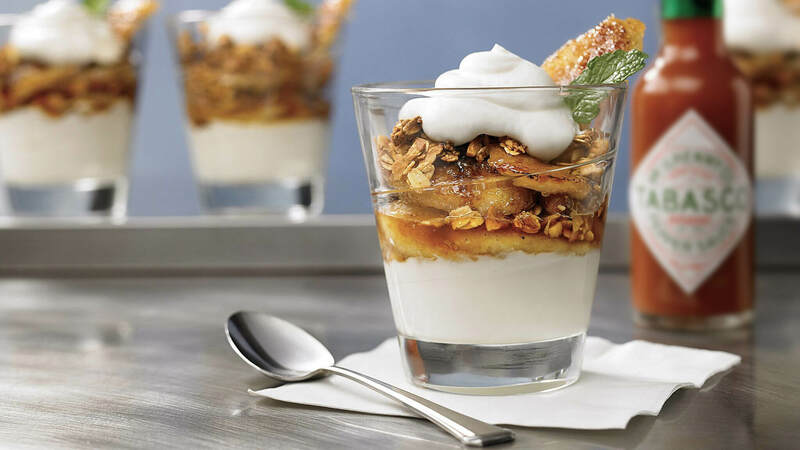 Breakfast meets dessert in this Bananas Foster Yogurt Parfait. The secret ingredient in the homemade granola is sure to leave diners guessing (and reaching for more). Yogurt parfaits are perfect for health-conscious consumers and have seen an increase in menu penetration by 18% over the past 4 years. TABASCO® brand Original Red Sauce, divided --- 2 Tbsp. Butter, room temperature --- 2 Tbsp. Vanilla extract --- 1 Tbsp. Bananas, thinly sliced --- 3 ea. Greek yogurt, vanilla --- 2-1/4 qt. Combine 1 Tbsp. TABASCO® Sauce with 1/2 cup brown sugar; fold in oats and peanuts. Lay out on a sheet pan, bake at 300°F for 25 minutes and allow to cool on the pan. Melt butter and remaining 1/4 cup brown sugar in a sauté pan over medium heat. Add vanilla extract and bananas, stir until fully combined and keep warm. Combine Greek yogurt and remaining 1 Tbsp. TABASCO® Sauce. Spoon into a tall glass, filling it one-third of the way. Spoon some of the warm bananas foster over top, crumble on some brittle, cover that with 2 Tbsp. of yogurt and garnish the top with more granola.